Nobody is going to be nominating COUNTRY STRONG for any awards anytime soon (with the possible exception of Score); but this critically lambasted movie is nowhere near as bad as you might think from the mainstream reviews. The critics are going to go to town on this movie…but I really liked it. In fact, I liked it so much that it was a shame that many of the songs were cut in half, or dissolve into the background during scenes, because the country music score in this movie is excellent. That being said, the story is standard old-fashioned melodrama….and not even that, it’s soap opera…It’s the kind of thing that might have been fresh in the 50’s or 60’s, but was already passe by the time television evening soaps rolled around (think Dynasty, Dallas, Falcon Crest). Tim McGraw turns in a very good performance, one that separates him from a wanna-be actor and a bonafide one. He has grown in each role that he has played (from drunkard in Saturday Night Lights to Sandra Bullock’s aftertought-of-a-husband role in The Blind Side), but here he truly comes into his own. 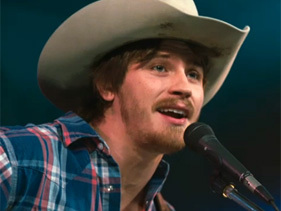 Being the only true country singer, he of course does not sing at all in Country Strong (although he and Gwyneth duet on the end-credits song). Leighton Meester (as singing and love rival) also has an energy and maturity level onscreen that goes far beyond what her television history would indicate. She radiates warmth and could easily be mistaken for a true country singer. Gwyneth Paltrow is the victim here in what turns out to be a thankless role. Recovering addict, most of the melodrama falls to her (leaving others to react to her crying, unpredictable behavior). She does a fine job with an underdeveloped and limited character, especially when the audience pretty much stops caring about her about halfway through the movie and turn their attention to the budding Hedlud-Meester romance. Still, the final concert sequences are superb, and there are flashes of movie delight when her already fragile character is forced to visit a make-a-wish patient and the movie finally spurts to life. This scene, and one in which she “tutors” her younger rival are the films highlights. She also gets the films lowlights — including an ending worthy of eye-rolling. The direction by Shana Feste is sure-handed. Somewhere along the line, I think she realized that the movie is little more than a modern-day update of all those old weepies you’ve seen before at the movies, and decided to just let it ride. The camera lingers on people just long enough to allow you to think about them. If only they had better material to work with. But overall, the film has a spirit and a heart that a lot of recent biopics have not. Sure, the story is made up, but it could be based on half a dozen real performers (think Brittany Spears, Lindsey Lohan, etc)… Does it have problems? Yes. Not the least of which is a scenic design that looks like they paid too much for the music soundtrack and didn’t have enough budget left to hire enough extras for other scenes. In a bus-loading scene it literally looks like the small-town bystanders watching the filming were asked to just fill in the background for a few minutes. In bar sequences, there are a dozen or so in the “Crowd”. But overall, the movie lingers quite pleasantly afterwards. Add extra points if you are a country music fan (I am). Forget that you have seen this movie done better half a dozen times already: go enjoy Hedlund’s superb performance, and enjoy this the way you would an episode of Dallas or Dynasty. I loved this movie! Garrett Hedlund is amazing. What talent!